You are currently browsing articles tagged GPO. 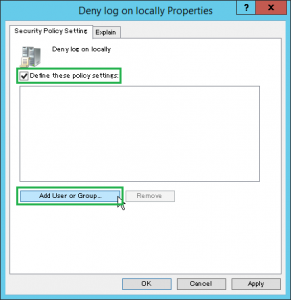 This article describes the way to create domain account and to set up group policy to deny local logon. 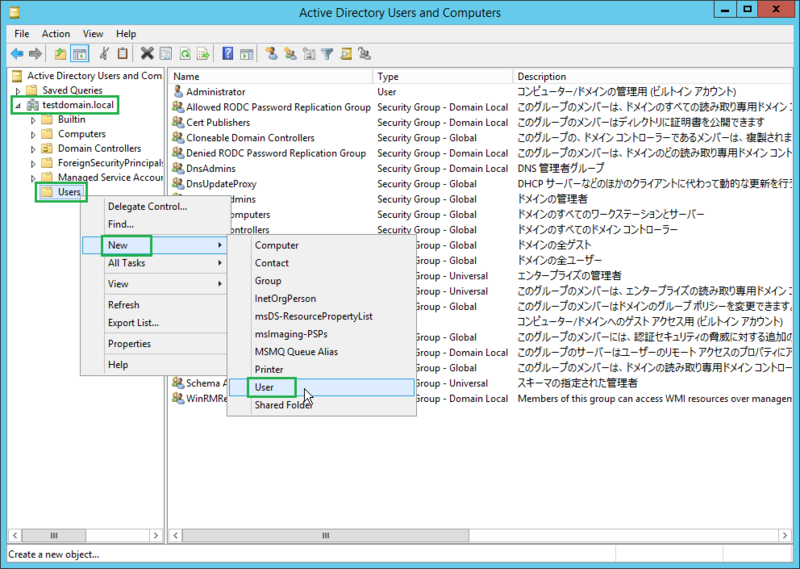 Open the [Active Directory Users and Computers] window at AD server, and open the [<domain-name>]-[Users] folder. 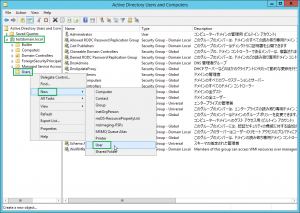 After that, open the right click menu, and select the [New]-[User] menu item. 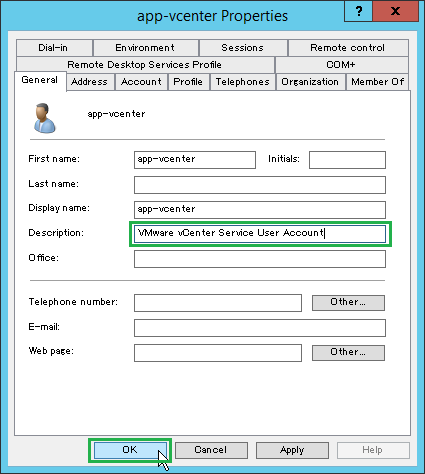 After opening the [New Object – User] dialog, input “app-vcenter” domain user account name as following, and push the [Next] button. Input first name into [First name name] text box. Input full name into [Full name name] text box. 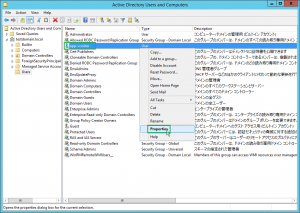 Input user logon name into “User logon name” text box and [User logon name (pre-Windows 2000)] text box. note: In order to simplify the user management, the [pre-Windows 2000] user logon name should be made the same as the [post-Windows 2000] user logon name. Input the following, and push the [Next] button. 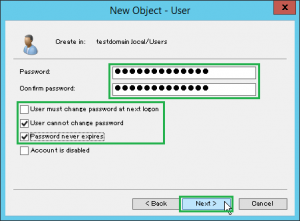 Input the user password into the [Password] text box. 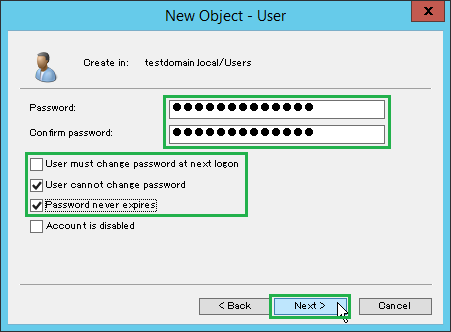 Uncheck the [User must change password at next logon] check box. Check the [User cannot change password] check box. Check the [Password never expires] check box. Push the [Finish] button. 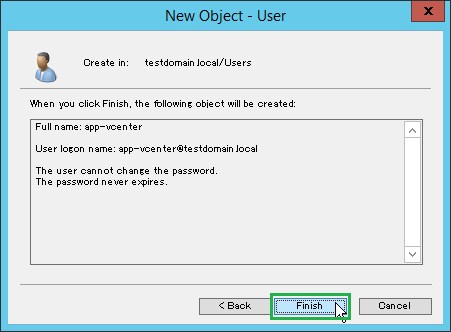 The [New Object – User] dialog will be closed. Check that the domain user account is created. 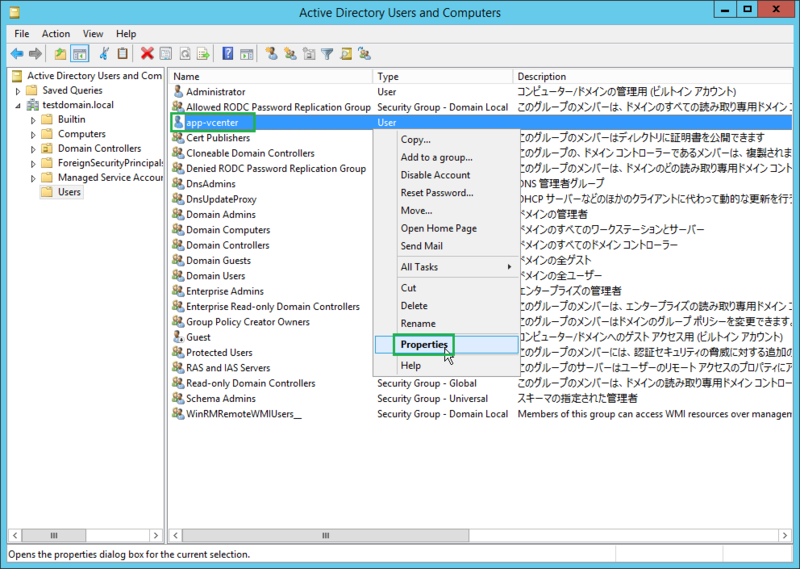 After that, select the domain user account created, open the right-click menu, and select [Properties] menu item. (Or double-click the domain user account). 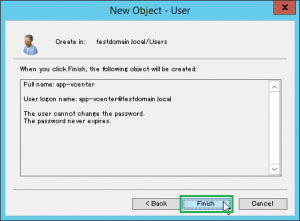 After opening [app-vcenter Properties] dialog, input the description of the domain user account into [Description] text box. 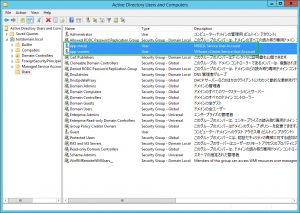 Furthermore, set up the domain user “app-mssql” in the same manner as above. Configure the GPO to deny logon via consoles and remote desktops. 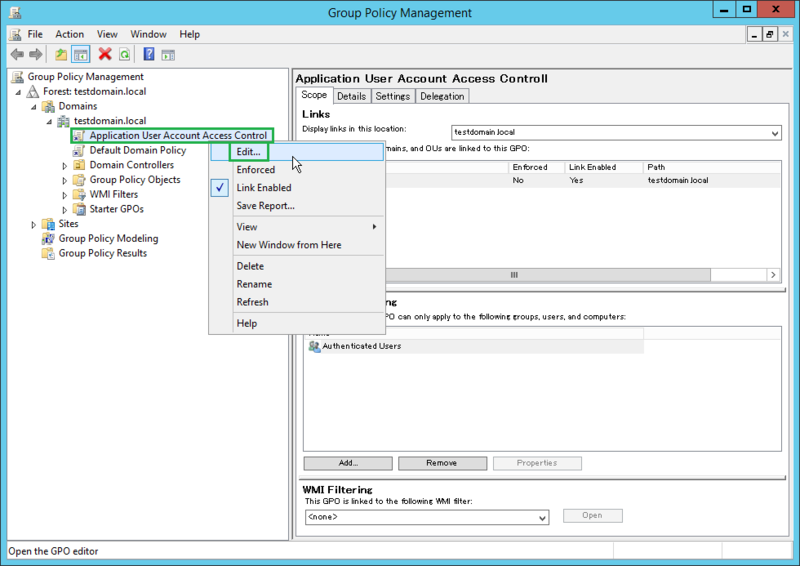 Open [Group Policy Management] windows, and select the [Forest: <forest-name>]-[Domains]-[<domain-name>] in the tree at the left side of window. After that, open the right-click menu and select [Create a GPO in this domain, and Link it here…] menu item. 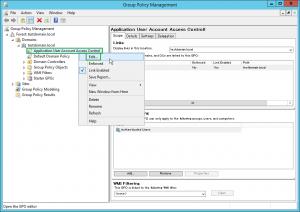 After opening [New GPO] dialog, input the GPO name as a “Application User Account Access Control”. After that, push [OK] button. Check that the GPO is created. 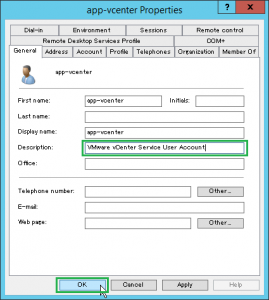 After that, select the GPO, open the right-click menu, and select [Edit…] menu item. Select [Deny log on locally] policy at [Policies]-[Windows Settings]-[Security Settings]-[Local Policies]-[User Rights Assignment]. After opening [Deny log on locally Properties] dialog, check [Define these policy settings] check box, and push [Add User or Group] button. 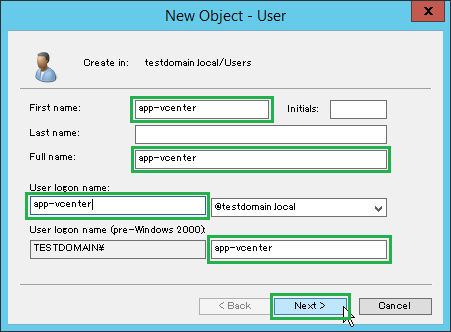 After opening [Add User or Group] dialog, input “<domain name>\app-vcenter” domain username, and push [OK] button. 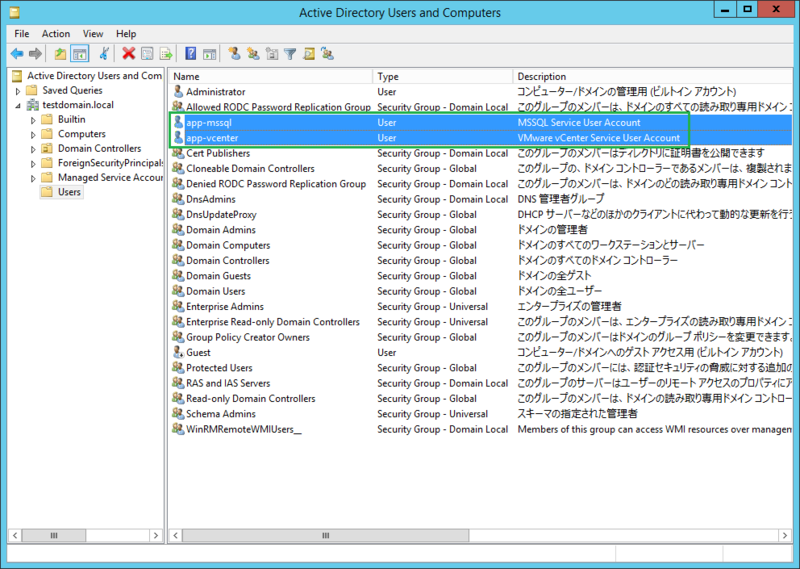 Check that the domain user account is added in the pane. 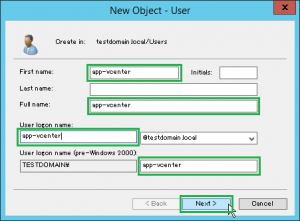 Furthermore, add “<domain name>\app-mssql” domain user account in the same manner, and push [OK] button. 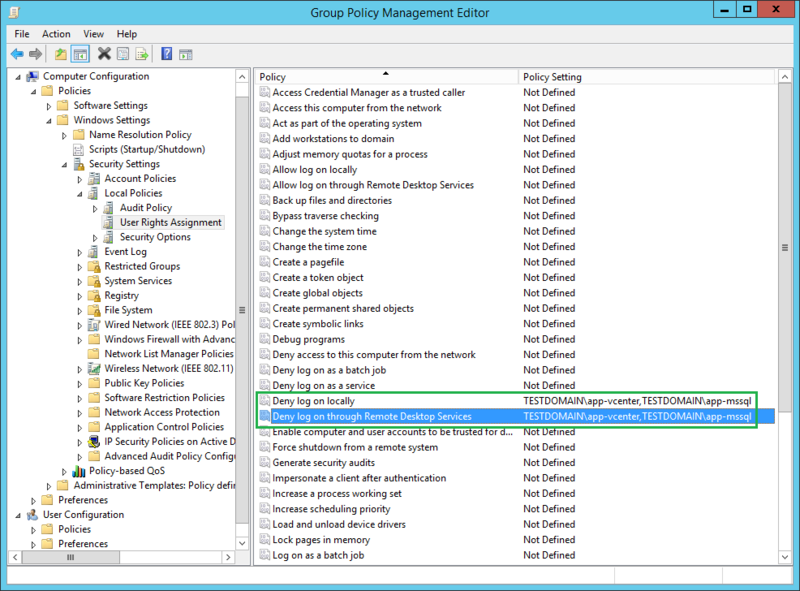 Check that the accounts are listed in [Policy Settings]. 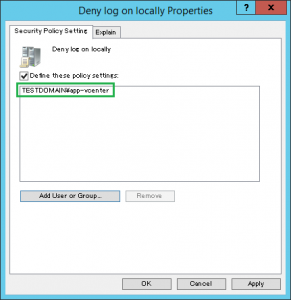 Furthermore, add those domain accounts to [Deny log on through Remote Desktop Services] policy in the same manner as above. 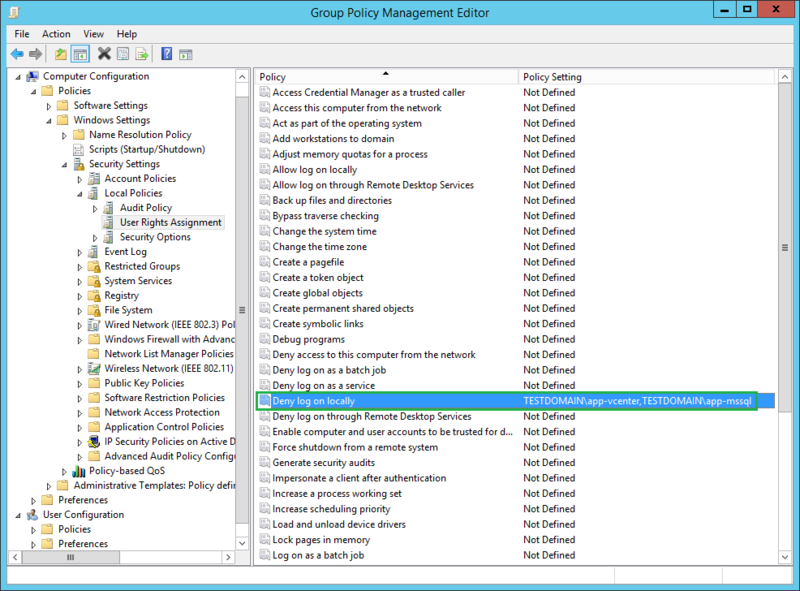 Finally, run gpupdate /force at the AD server’s command prompt to update the group policy immediately.